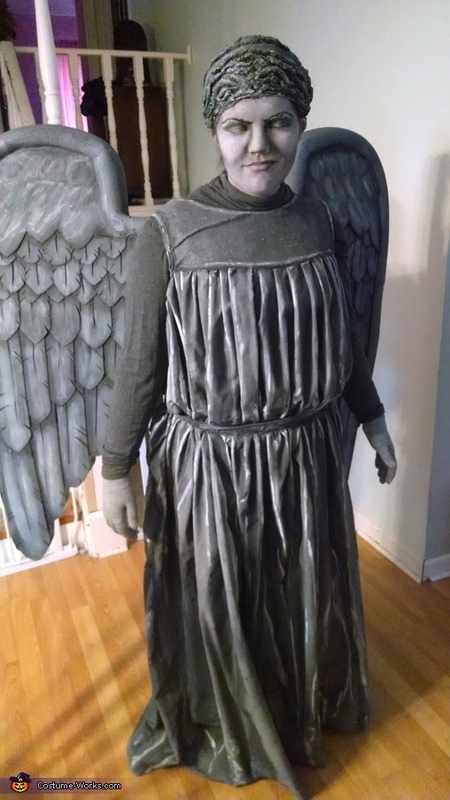 Of all the villains in the Doctor Who universe, we find none more terrifying than the deliciously creepy "Weeping Angels." My daughter Elizabeth had been asking for this costume for a couple of years now but finding it pretty intimidating I kept putting her off. I finally decided to go for it this year and I'm so glad I did! The single biggest tip I can offer anyone wanting to do this is to start EARLY. We started the project in early-to-mid September and it gave us time to carefully plan everything out and not be rushed. The wings are styrofoam and took about two weeks (working in the evenings after work) to complete. The wig is made of paper clay and is actually a do-over after a yarn attempt failed spectacularly. We are happy with how it looks but is very heavy. I did the dress last and it is made from a gray queen and twin sheet sewn together. Everything is painted with gray primer and black & white acrylic craft paint. The wing harness is also a second attempt as our first one did not work at all. But a $10 back support belt from Menards was a total game changer! I removed the elastic straps and sewed on some non-stretchy webbing. I've included a picture of the harness. The weight of the wings (and they weren't super heavy) is supported down on her back and not pulling at her shoulders. You can see the plastic pipes attached to the harness, the wings had slightly smaller pipes that slid down into them. Overall we were very happy with the result and it was worth the bumps along the way! We probably spent about $100 on materials but that's including the "do-overs" so if I were to do it again it would not be quite that much. It was a little at a time over the six or so weeks so never a huge chunk of money at once and we were able to budget for it. It also really helped to stalk various cosplay sites for research, and I watched a few makeup tutorials on YouTube so that was EXTREMELY helpful.